One initiative I have become interested in over the past two years is community gardening, and I have subsequently experimented with hydroponics and Biochar. These have been published elsewhere in this eZine. 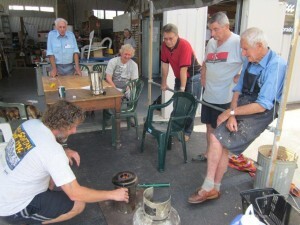 On Friday 7th November 2011, as a volunteer bus driver I took the Nundah Men’s Shed1 members to the Labrador Men’s Shed2 and spent the day being shown over the premises by their president, Frank Law. 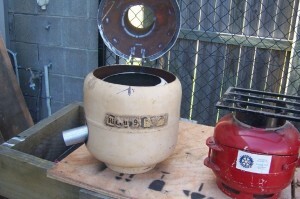 One initiative I noticed was the conversion of old LP gas bottles to a camping stove for use in developing nations such as Vanuatu. The project is under the general auspice of Peter Fearnside and several hundred have been taken over there and also to India and some other countries I forget. 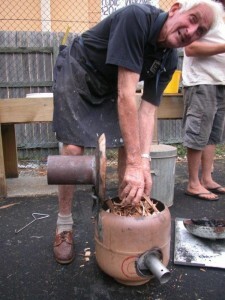 Subsequently in discussions I suggested to Peter the idea of a modification to enable the gas bottle stove to make Biochar. This was most warmly and practically embraced by Peter and subsequently basic plans were discussed and developed. Prior to this I had Skyped my Biochar colleague Dolph Cooke of the Aust Biochar Project in Northern NSW about the possibility of the modification. He said ‘yes’: he had designed one and had wanted to find a group to test this on. This modification would then allow the production of Biochar which can be put back into the soil and improve its fertility – thus, to an extent, closing the cycle. Plus with proper preparation one can get a second burn with the charcoal so that actual use of the bio-source-stock wood is reduced. 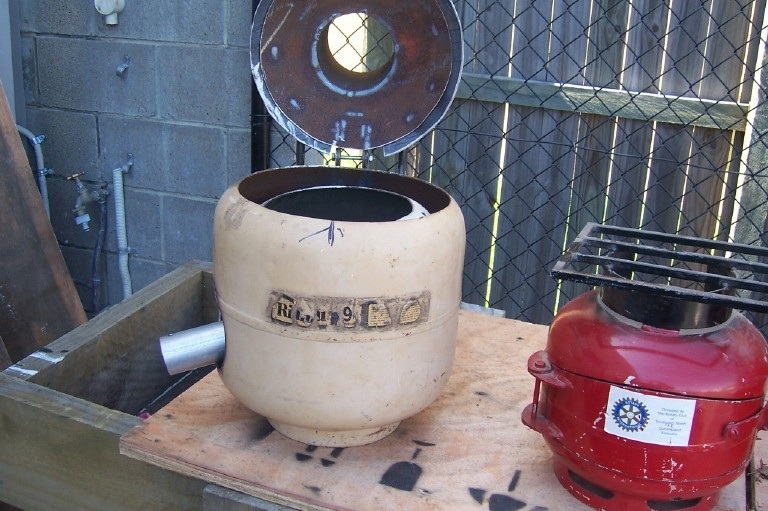 I then met with Frank Law and the gas-bottle-stove project leader Peter Fearnside and team Robert Decolle and Roger Wilcox, and the Biochar adviser Dolph Cooke and planned a ‘proof of concept’ stove. The Nundah Lions Club Meeting has allocated $250 for the proof of concept modification and its testing jointly with the Labrador Men’s Shed and Australian Biochar Project3. 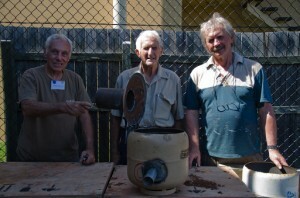 In short in co-operation with the Labrador Men’s Shed, the Biochar Project and the Nundah Lions has resulted in the development of a village Biochar kiln for dual use of cooking + making Biochar which can then be used as a coral reef in one’s garden (as it were) to increase soil fertility and thus help close the eco-loop in third world countries such as Vanuatu. This also has the knock-on advantage of helping to stop deforestation and kids falling into open fires – which many do and many end up with horrible deformities such as their chin stuck to their chest via skin burning. The Proof Of Concept (POC) project stove test firing first occurred on the 28th of November, 2011 and with some further modifications the proof of concept stove should move to prototype bio-char stove finalisation by mid-January 2012. Plans are being discussed for basic training of the stove in the use of the stoves in the correct procedure to make Biochar, its use in home agriculture and sale on the Internet. Overall this project can offer a small modicum of ‘practical help’ which can be used elsewhere, and does this by using traditional Australian bush ingenuity and practicality to help others. Importantly the Men’s shed team formed an informal Learning Circle and have identified specific learning’s from this process. I explained the link between Action Learning Circles (the action being the development of the prototype) and Adult Learning. 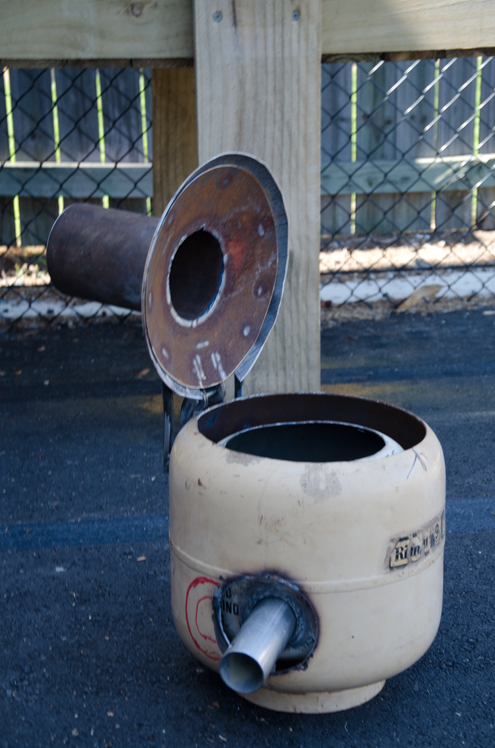 This learning circle idea has been applied to Biochar as evident elsewhere in this eZine plus it has entered the ‘sharehood’ of sharing resources, know-how and tools4. Congratulations to the Labrador Men’s Shed and in particular the gas-bottle stove team and thanks to The Biochar Project manager Dolph Cooke for technical advice. *Further information: I am one of the two founders of the men’s movement in Qld in the late 80’s (BMG – Brisbane Men’s Group 1988-1992). This in turned led to a number of initiatives such as Men’s Help Line, Qld Men’s Festival and the Men’s shed movement as well as several other men’s groups in South East Queensland, Australia. I was a single father of two primary aged children during this time and published about men’s issues and single fathering – still rare today. Further the Biochar group I am on the board of has just received a UN Millennium award, more on this if you are interested see the relevant article in this eZine. I contributed to the Men’s Shed Application for Nundah Senior Citizens Centre (of which I am on the board) and the application was successful. 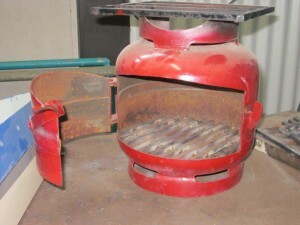 In connection with the 4P+ (Poor Peoples Profit for Planet) initiatieve in Cameroon we are on the look-out for a simple char producing cooking stove. 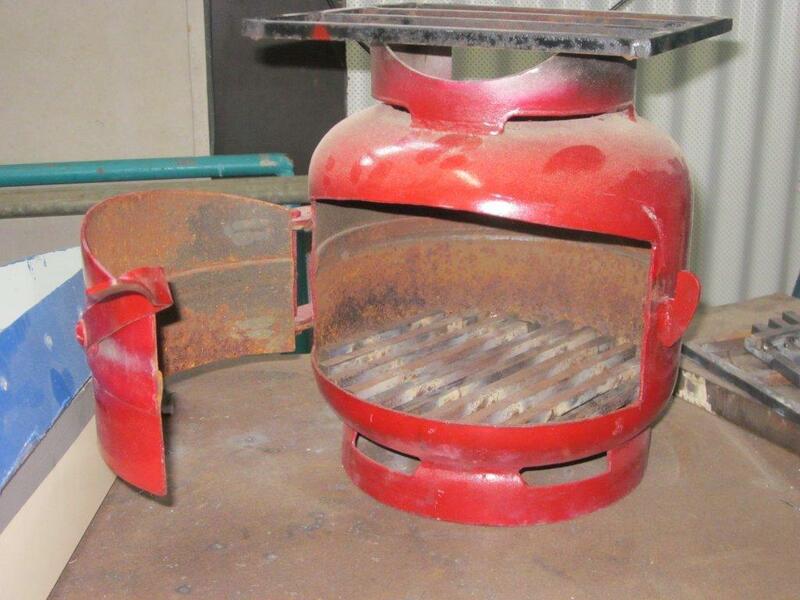 Has your stove already been tested and do you have any performance data. Much obliged if you could provide us with your experience.